The past month has absolutely flown by. And even though it feels like it went by so fast, I feel like Ruby has changed SO MUCH in that time. She's doing different things everyday. Her personality is emerging. She's GROWING! It's crazy. I LOVE her. Can you clone her and send me a copy?? 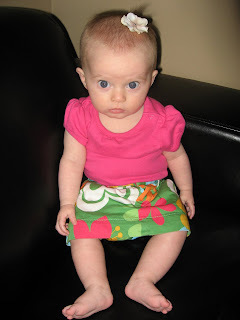 LOL...LOVE the outfit & the little flower in her hair. So cute! OMG, can she get any cuter? I think you will have your work cut out for you when she is a teenager because she is just too adorable for words. And, ya know I think she sort of knows it judging by the second picture! I love her facial expressions! I remember the 4 month mark so well because it's when the personality really starts to shine through. 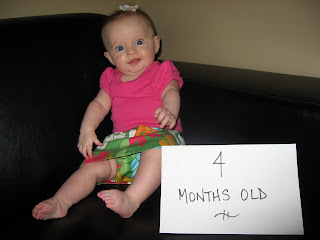 Happy 4 Months Ruby!!!!! She's so sweet! She is so lovely! And in these pictures I can really see that she looks like you - do other people say that? I didn't really see it when I met you but I can really see a similarity now. That last picture is a total keeper! You just made my heart skip a little beat from jealousy of not having a little girl to dress up like that anymore. Ugh. She's adorable. 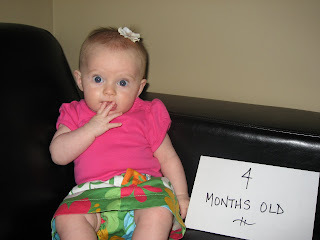 Happy 4 months! Oh my goodness! I can't stop oggling! She is so gorgeous! Honestly one of the cutest I've ever seen!